Stacy Cannella is the Nursery teacher at Divine Wisdom Catholic Academy in the Douglaston campus. 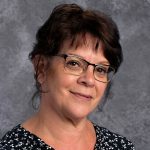 This is Mrs. Cannella’s sixth year teaching in Douglaston and prior to that, she has taught Pre-Kindergarten, Kindergarten, and First Grade at the Bayside campus for seven years. Mrs. Cannella has an enthusiasm and passion for teaching which she brings to the classroom everyday. She believes that it is important to create a warm and nurturing environment in which the children are happy and excited to come to school. She loves the challenge of combining play, socialization, and the learning of basic academic skills.